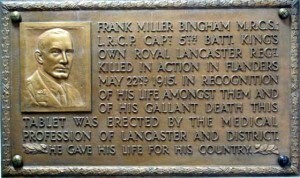 The last issue followed the East Lancashire Territorials in Gallipoli during 1915, fighting Turkey. From 1914, infantry battalions of the West Lancashire Territorial Force (TF) (from Warrington to Ulverston) went to reinforce the Regulars in France and Flanders. In Volunteer 100, we saw them adapting to active service. More serious operations were about to take place. Early in 1915, the French pressed for British attacks. With neither light machine guns nor well-supplied with ‘bombs’ (grenades), British infantry used elementary tactics depending on rushes by sections or platoons, covered by rifle fire. The first offensive, March 1915, was at Neuve Chapelle when British and Indian divisions, reinforced by TF battalions, made an initially successful attack, with heavy casualties, after a concentrated artillery barrage. At 7.30am the artillery bombardment commenced, and never since history has there been such a one. You couldn't hear yourself speak for the noise. It was a continual rattle and roar. Difficulties in passing information and consequent lack of rapid reinforcement produced deadlock. The lesson of the concentration of artillery in terms of guns per yard of frontage was forgotten and rediscovered only later as gunnery tactics improved. Meanwhile, there were grave shortcomings in the supply and reliability of shells. Major tactical improvements appeared only at the beginning of 1917, resulting from Lewis gun sections and specialist rifle bombers in every platoon and with better trained platoon commanders capable of battlefield initiative. The West Lancashire Territorials joined the fight in 1915 at a precarious moment. Early Territorial departures to the fighting were the Royal Engineer (RE) Field Companies. The 1st Cheshire Field Company, based at Birkenhead’s Harrowby Road, reached France on 10th December 1914. Occupied with much hut building and maintenance work, occasionally doing infantry training, they were in the front line to dig assembly trenches and directly support the Liverpool Scottish (another 1914 arrival) in an attack near Ypres on 16th June 1915. 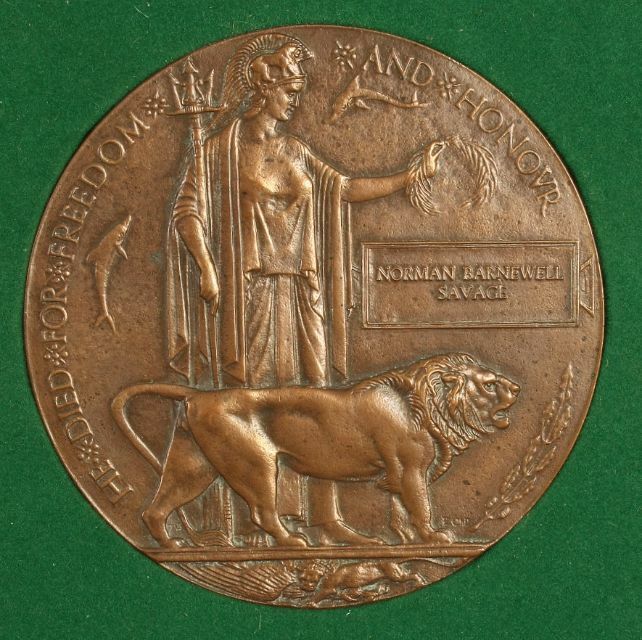 For conspicuous gallantry and devotion to duty on several occasions, notably on a night when he assisted wounded men into cover at great personal risk. Also in the same place, when, after being buried in his dug-out, he assisted others who had also been buried, and carried wounded men into safety under heavy shell fire. Godfrey was killed on 31st July 1917, the opening of the Passchendaele campaign. Surprisingly, the National Archive shows he arrived in France on 31st December 1914, perhaps with an advance party, entitling him, had he survived, to the ‘red’ chevron. The Germans’ first use of gas on 22nd April opened the Second Battle of Ypres, lasting until 25th May. There were hastily improvised counter-attacks, often lacking both wisdom and preparation and sometimes without clear objectives. Also hastily improvised were gas counter-measures. ‘Respirators’, far from today’s General Service Respirator, were generally chemically-soaked cotton-waste pads, tied over mouth and nostrils and clenched in the teeth. Astonishingly, they saved lives. More advanced was the ‘smoke helmet’, a hood tucking into the collar of the tunic, developed through self-experimentation by university lecturers, some serving Territorials dragged from the comparative safety of front line trenches. No details were given to us … we [and the regiment we were supporting] had not the slightest knowledge of the ground or the [German positions] … whole thing was very badly planned or rather there was no plan at all. None of the [six] battalions … had the slightest idea what they were going to do… and not a single officer had the slightest idea of the proper direction. The attack changed direction twice and finally fizzled out in a ditch about five or six hundred yards from the German position. C Company, 1/6th Bn. The King’s (Liverpool Regiment) suffered similarly on 5th May. Known as ‘The Liverpool Rifles’, this was a ‘smart’ TF unit with many well-educated soldiers. 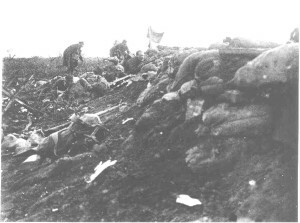 Their diary states the Brigadier personally ordered an immediate attack (apparently unsupported) at the bitterly contested Hill 60. Advancing in ‘India File’ [sic] until the firing line (two platoons) was forced to deploy, they continued by ‘section rushes’. Casualties were 15 killed and 45 wounded. The Merchant Taylors’ School magazine (in Crosby) later carried anonymous accounts; all named had attended MTS. “ … The Germans had gassed our men on ‘The hill’ and we met crowds of them in a pitiful condition. … we came up under heavy shell fire, losing men all the way, under close fire from the hill ... Sergeants Royle and Milton wounded, two Fairbairns and Tommy Teague killed. Ridge, Geo Batcheldor [sic], Eastwood, Hutchinson, Lindsay, Taylor, Miller, Whinyates, Le Rougetel and heaps of others, wounded." Milton, a pre-war Territorial, was discharged ‘unfit’ in 1916. Teague, a metals analyst, had joined on the very day war was declared. In October, his family received, from the Front, his shaving kit, gloves, a flashlight … and a flute. Major Bates’ son died in my arms [9th May]. We had nothing to eat or drink for two days, so Lt Bates said he could spare us a bit of bread, and while he was handing it round the corner he was shot in the neck, and dropped into my arms. Lt Stanley Bates was 17, the youngest full lieutenant in the Army, commissioned from the Royal Lancaster Grammar School Cadet Corps, now buried at Aeroplane Cemetery, Ypres. 15th May: Attack started at 11.30 pm. A & B Companies … moved over parapet about 10.45 pm & waited. Attack successful, German line carried. Half D Coy took up ammunition later … 16 May: … attempted to send up reinforcements, but they were wiped out by machine gun fire. About 200 yards of enemy’s trenches surrendered roughly 250 men. Our casualties heavy [Officers killed and missing 9, wounded 4; Other Ranks killed, missing and wounded 220 approx]. Sporadic heavy bombardment. 17 May: Still heavy … bombardment. Collected wounded & dead, buried the latter behind [objective]. Lack of space means that it is not possible to give accounts of attacks by other West Lancashire battalions such the 1/9th King’s in May or the attacks during the battle around Festubert (15/16th June) by 1/4th Loyals from Preston (Killed 26, Wounded 266, Missing 110) and 1/8th King’s, the Liverpool Irish (Casualties 232) or the Liverpool Scottish in the diversionary attack supported by the Cheshire Engineers at Hooge on 16th June (4 Officers and 75 other ranks killed; 11 Officers and 201 other ranks wounded; 6 Officers and 103 other ranks missing – almost all were subsequently reported killed). An account of the Liverpool Scottish centenary commemoration visit to Belgium appears elsewhere in this issue and we include here some of the famous photos taken under fire on the German frontline by Private Fred Fyfe of the ‘Scottish’. The period of 1915 was for the Territorials very much what Lyn MacDonald described in the title of her book that uses Fyfe’s photo on the paperback cover: The Death of Innocence. The next article will look at the recovery of the infantry battalions, involvement in the Battle of Loos and the deployment of North West TF artillery units in support of the Canadian Divisions. It is also hoped consider some of the region’s many Territorials who transferred to the rapidly expanding Royal Flying Corps.